In the first installment of this series, I looked at team values provided by Forbes. According to regression analysis, team value is a function of team revenue. I also looked at the correlation between a team’s winning percentage and a team’s value. Though a relationship certainly exists between the two variables, a winning team and a high value team are not always one in the same. There is noticeable variability between the two factors, demonstrating that a team’s business value is related but not fully dependent on how well it performs on the field/court/ice. In this post I will try to break down the major determinant of team value: revenue. I will also look at team costs, with the goal of comparing how the size and source of revenues and costs differ among the major leagues. I think a good place to start is to take a look at the total revenue of each league given by Forbes after the 2008 NFL and MLB seasons and 2008-09 NBA and NHL seasons. The chart below shows the sum of the revenues of teams in each league. The NFL is the richest at $7.58 billion. 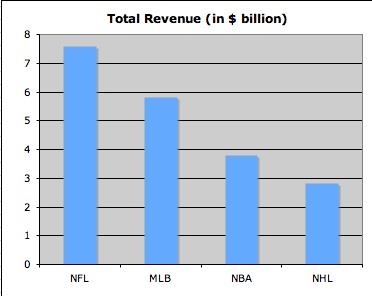 Following football is the MLB at $5.82 billion, the NBA at $3.79 billion, and the NHL at $2.82 billion. What are the components of these revenues? 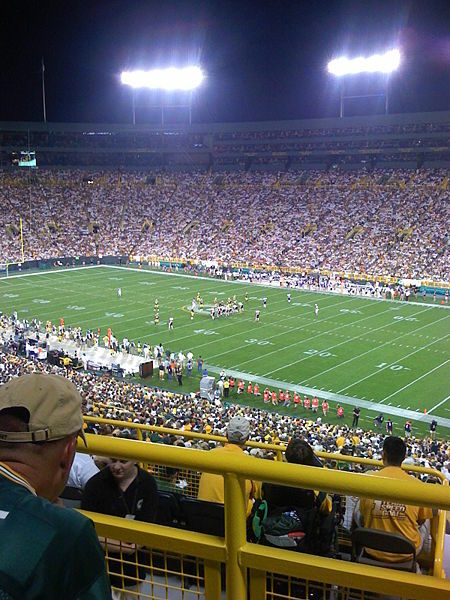 Using the Green Bay Packers’ income statement, we can figure out the importance of the different revenue sources in the NFL. Keep in mind that this is just one team in one league, so the numbers aren’t necessarily representative of all teams or all leagues. What sticks out though is the size of the revenues generated through national media (television and radio). Of the four leagues, this is unique to the NFL, which has the highest percentage of its total revenue coming in from national media deals. As the chart shows, television and radio deals make twice the money that ticket sales do. Also important to consider is that some of these media deals could be guaranteed in the event of a lockout in 2011. The large national media deals in the NFL put less emphasis (on a percentage basis) on locally-driven revenues. The MLB, NBA, and NHL are more locally oriented and place a greater emphasis on ticket sales and local media. Past figures from Forbes seem to indicate that local ticket revenue makes up a little over 20% of total team revenue in the NFL. For the Packers the figure is 19.1% or 24.2% depending on whether you include private boxes or not. In the NBA the figure is slightly over 30%, in baseball the figure is about 37% and in the NHL the percent of revenue from local ticket receipts is around 43%. On the cost side, player wages reign supreme. 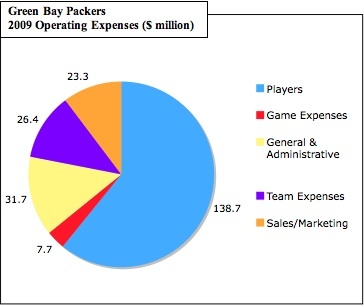 The breakdown of the Packers’ costs is shown in the chart below. 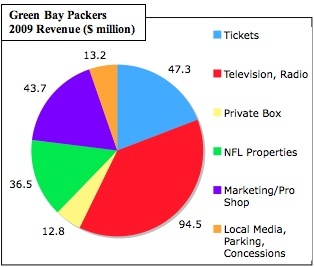 According to the Green Bay income statement, 56% of total team revenue was spent on player salaries. In the four professional leagues, percent of revenue spent on players is usually between 55 and 60%. Despite the similarity in average player costs, variability in money spent on players differs in each league as a result of salary cap/floor rules. As a percentage of the league average, the standard deviation in player costs among teams is lowest in the NFL (6%) and NHL (11%). The NBA has a slightly higher standard deviation at 13% and the MLB is by far the highest at 34%. What these figures mean is that player costs vary most widely among MLB teams. The New York Yankees spent $236 million on player compensation in 2008 according to Forbes while the Florida Marlins spent a league-low $45 million. The reason this is possible is that MLB has no salary cap/floor restrictions other than the luxury tax and minimum salary requirements. The NBA has the next highest spread because its salary cap/floor is “soft” meaning there are several means by which teams can go over and under the bounds (some exceptions relate to player tenure, injuries, and trades). The NFL and NHL have the strictest “hard” salary bounds (though the NFL is about to enter an uncapped/unfloored year), which is why the standard deviation in team player costs is the smallest of the major North American leagues. In the next post I’ll move on towards team profit. How is team value correlated to the bottom line? The answer may not be as obvious as you think. In 2008, the New York Yankees had the largest revenue and second lowest margin in baseball. The Florida Marlins had the smallest revenue and the highest margin. Very good analysis. What do you make of the current season? Is it heading in a good direction or a bad direction? Where is the link to Part 1..?? And why is this post missing from the sequential post ‘stream’ from the home page..? ?